This page is devoted to the accomplishments of individuals with some of the dogs that we have bred. There are more pics of dogs bred by us on our "retired" page, "co-owned" page, and "rainbow bridge" page. AKC GCH. Rockstaff Faithful And True "Ivy"
Ivy is the 20th AKC champion we have bred. She is pictured here at 19 months old winning a 5 point major. She is out of GCH. Prada Classic Aran Isle At Donnellas CGC and our girl GCH. Rockstaff Wintertime Sprite CGC. She is a full littermate sister to our boy Rowan and our girl River. Ivy is loved, owned, and handled by Jennifer Wall and her family. A special thanks to the great job they have done with Ivy. AKC Ch. Rockstaffs Sonic Boom "Sonic"
Sonic is out of Ch. Dauntless Duking It Out CD RN CGC and Rockstaff Dixie Crystals. She is out most recent champion. A special thanks to the Kriger family (Full Throttle Staffords, Alalska) for giving Sonic such a great home and doing such a wonderful job handling her. Sonic is L2-HGA and HC genetically clear. AKC Ch. Rockstaff Milli U.O.E.N.O. "Milli"
Milli is pictured here at just 11 months old. She is out of our boy Ch. Rockstaff Mr. Pibb CGC and our girl Ch. 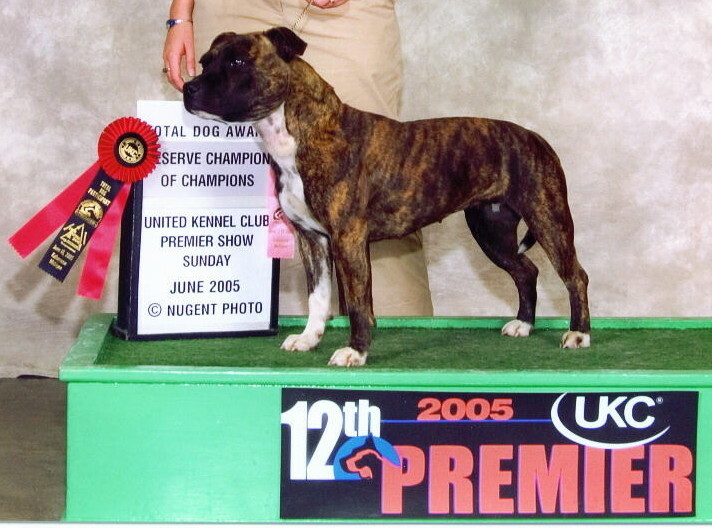 Rockstaff Diamond In The Ruff CGC. Milli is loved, owned, and handled by Julia RouLaine (LaffyStaffy Staffords). She is L2-HGA and HC genetically cleared. Thanks Julia for the great job you have done with Milli in the show ring. UWP UKC GRCH. Brave Bull's Gypsy Queen "Boots"
Boots is out of Ch. Dauntless Duking It Out CD RN CGC and Sheza Hunny Pooh CD CGC. She is owned and loved by Jose Cintron. She is L2-HGA and HC genetically clear. AKC Ch. Rockstaff Red Buddy Of Mine "Buddy"
AKC Mjr. Ptd. Rockstaff Hooh Hah Yeah Boy Now "Buster"
Buster is out of Ch. Dauntless Duking It Out CD RN CGC and Ch. Rockstaff Hollywood Starlet CGC. 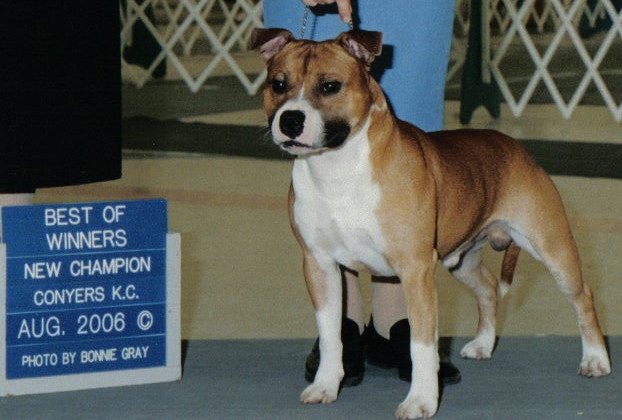 He is AKC major pointed and the 2008 Great Western Terrier winners dog and award of merit winner. Buster is loved, owned, and handled by Cyrus Card. He is L2-HGA and HC genetically cleared. AKC Ch. 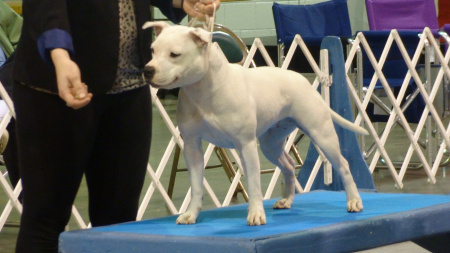 Southerstaff Lady Delilah "Fatty"
Fatty is out of Ch. Dauntless Duking It Out CD RN CGC and Ramstaffs Lil Miss Sadie Mae. She is owned, loved, and handled by the Puentes family. Fatty is the first AKC champion that we bred. Kane is out of Ch. 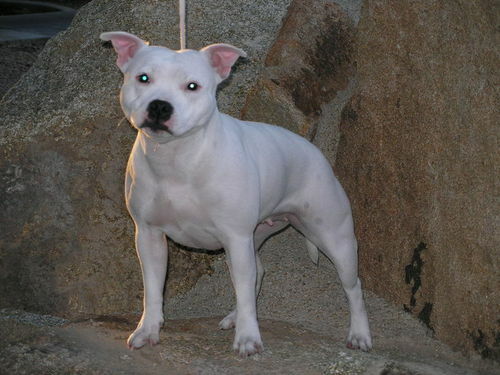 Mimes-Staff Red Rebel and Sheza Hunny Pooh CD CGC. Kane is AKC major pointed. He's owned, loved, and handled by Quintin Smith (Royalstaffs). Kane is L2-HGA and HC genetically cleared. AKC Ch. Rockstaff Destined To Be Queen "Queen"
Queen is out of Ch. Pinehill's Mr. Impressive and Ch. Rockstaff Bella Georgia CGC. She's a littermate sister to Ch. 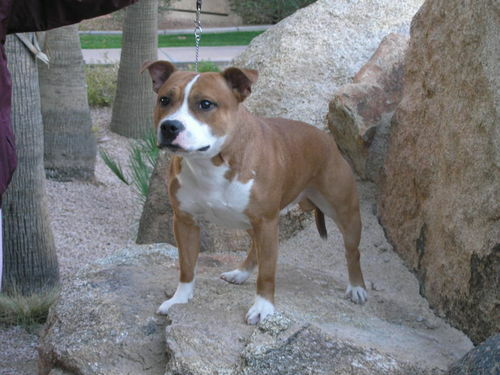 Rockstaff Mr. Pibb CGC and Ch. Rockstaff Dixie Crystals CGC. Queen is loved, owned, and handled by Quintin Smith (Royalstaffs). 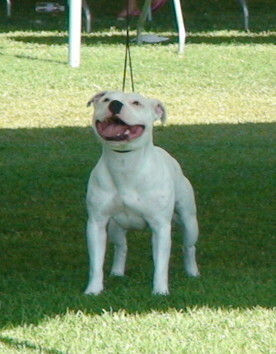 AKC Mjr. Ptd. Rockstaff Bit O' Hunny "Bitsy"
Bitsy is pictured at just 6 months old. She's out of Ch. 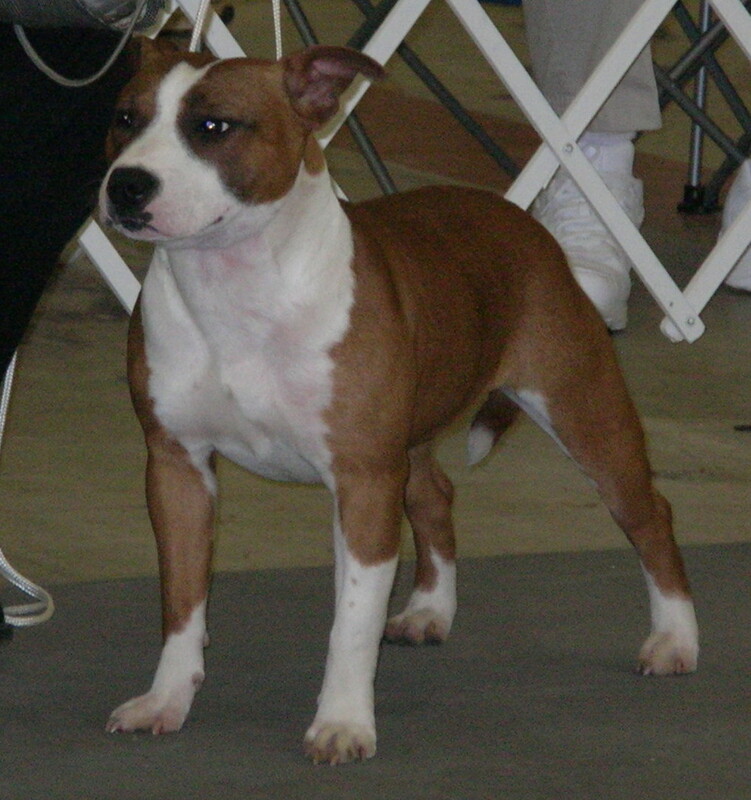 Mimes-staff Red Rebel and Sheza Hunny Pooh CD CGC Bitsy is AKC major pointed. She is co-owned with the Puentes family. She is L2-HGA and HC cleared. 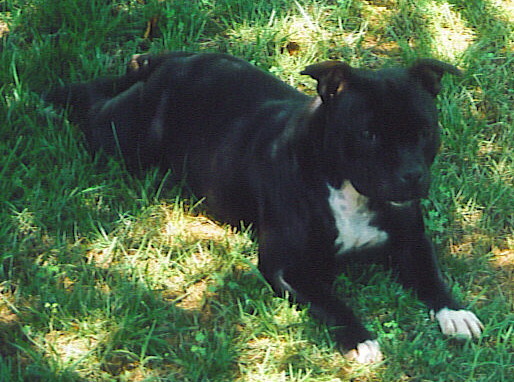 Tasha is pictured here at 1 yr. old. She is out of Ch. Rockstaff Red Jasper Of Mine CGC and Ch. Rockstaff Wintertime Sprite. Tasha is loved, owned, and handled by Hugo Noa. She is L2-HGA and HC genetically cleared.